Staring at your phone and waiting for something to happen: Looks like fun? 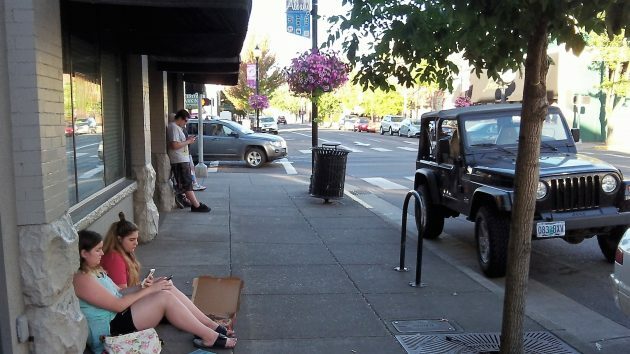 Something was going on in downtown Albany Tuesday night. 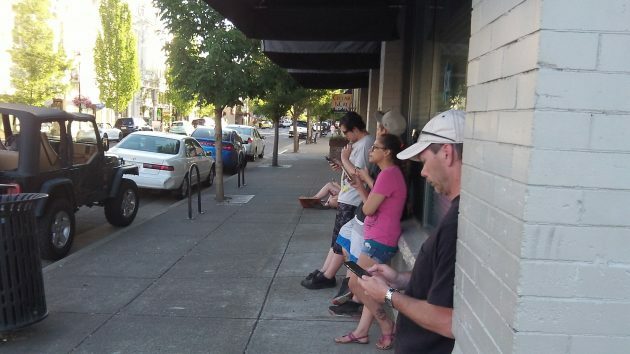 Dozens of people converged on the corner of Ellsworth and First, staring at their phones. I figured it had something to do with Pokémon Go. Sure enough, it did. I had to ask one of the players, and he was kind enough to explain to an old guy how it worked. Sad to say, the old guy didn’t get most of it. The gist seemed to be that Tuesday night in this “augmented reality” game there was something significant about that particular street corner — he showed it to me on the map on his phone. And that’s what all these people were waiting for. Well, I hope they got what they were hoping to find. But I don’t mind admitting having doubts about a game that has seemingly sane young people mesmerized enough to make them congregate at the command of an unseen game designer far away. Seems to me that a technology so psychologically powerful had better not fall into the wrong hands. And if it does, what could anybody do about it? On the other hand, those people looking at their screens did not act like zombies. Some were laughing, others talking to each other. Clearly they were having a good time. Not just for the kids? Looks like a variety of ages and a couple genders in your images. I look at this as fad. Like the latest dance craze. Here today, gone in a few weeks. I have no doubt many companies are studying AR to see how they can make a buck. It may just be another stepping stone to VR – virtual reality. My wife and granddaughter got hooked about a week ago. They get in lots of walking! Just another way for game designers to make some bucks. You shouldn’t have doubts about something that’s able to get millions of people out of their house like this. It’s pretty amazing really, suddenly seeing downtown Albany (and Lebanon) full of friendly people. My girlfriend and I play every day and we’re in our 40’s. I don’t know if this particular game will last, but now that the general public has had a taste of what’s possible with augmented reality, there are going to be a ton of copycat games by this time next year and I bet some of them will be even better than Pokemon Go.